In a scenario in which naval combat is allowed, Ocean hexes are passable. See the Naval Warfare rules. In scenarios where all hexes are Ocean hexes, there is no need to mark them with terrain tiles. In a scenario where Ocean and land need to be differentiated, players who own C&C:Ancients may use Shoreline tiles or the shoreline may be marked by River tiles. This is a temporary fieldwork, which may represent portable wicker or wooden shields, abatis, trenches, moats or bamboo frameworks. They will cover only certain hexsides, as marked on the terrain tile. Palisades are passable and do not obstruct line of site. 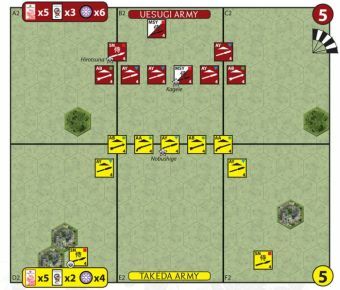 A unit on a Palisade hex ignores one sword and may ignore one flag result for any attack coming across a Palisade hexside. An ordered unit adjacent to a Palisade hexside may attempt to destroy it. 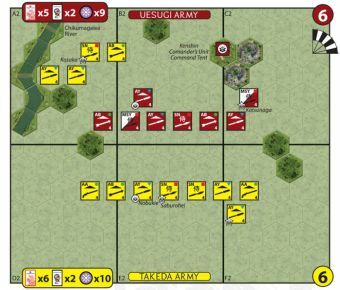 The player announces that he wishes to attack the Palisade rather than an enemy unit and rolls the unit's normal close combat dice. This may be increased by Leader Inspiration and Command or Dragon Card effects. Any sword result will destroy and remove the Palisade tile. In the case of an attempted destruction of a Palisade tile, enemy units in the Palisade hex are not being targeted and therefore may not battle back. Players owning C&C:Ancients or C&C:Napoleonics may use Rampart or Redoubt terrain tiles to represent Palisades. This is a semi-permanent fortification constructed of earthworks, wooden or stone walls and towers. Stockade hexes are passable and block line of site between non-stockade hexes. An ordered unit must start the turn adjacent to a Stockade hex to enter it and must stop when entering it. 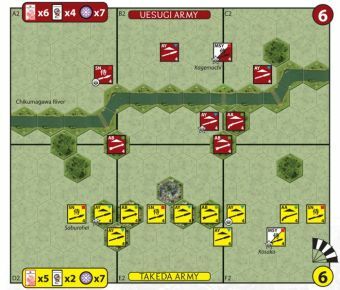 Cavalry units and cavalry leaders may not enter a stockade hex. A unit on a stockade hex may ignore 1 sword and 1 flag in combat. 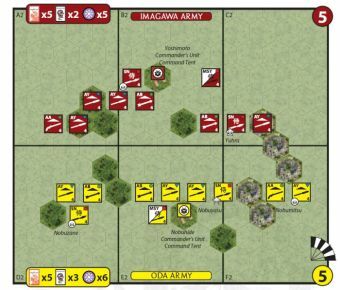 A unit performs close combat into or out of a Stockade hex with a maximum of 2 dice. 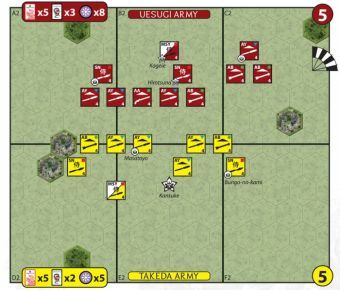 Units on a non-Stockade hex perform ranged attacks into a Stockade hex with a maximum of 2 dice. Units on a Stockade hex perform ranged attacks at their normal value. All battle rolls may be modified by Leader Inspiration and Command or Dragon Card effects as normal. 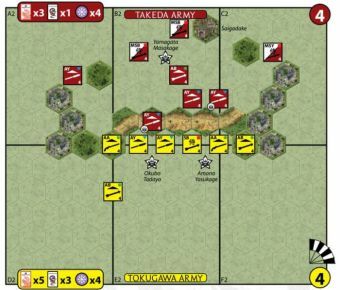 A unit on a Stockade hex being targeted in close combat by a unit on a non-stockade hex may battle first (as if playing a First Strike card). An ordered unit adjacent to a Stockade hex may attempt to destroy it. 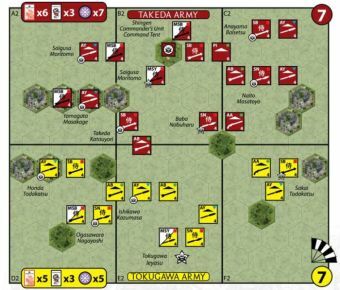 The player announces that he wishes to attack the Stockade rather than an enemy unit and rolls the unit’s normal full close combat dice (this is not reduced to 2 dice and may be modified by Leader Inspiration and Command or Dragon card effects). If the attacking unit rolls 2 or more Swords, the Stockade tile is destroyed and removed from play. Any unit on the Stockade hex at the time of its destruction loses 1 figure. In the case of an attempted destruction of a Stockade tile, enemy units in the Stockade hex are not being targeted and therefore may not battle back. Players owning C&C:Ancients may use City Wall terrain tiles to represent Stockades. An arrow tower tile may be built on a Palisade or Stockade and obeys all normal rules for its associated terrain type. A Palisade Arrow Tower provides protection to the unit occupying it through all 6 hex sides. 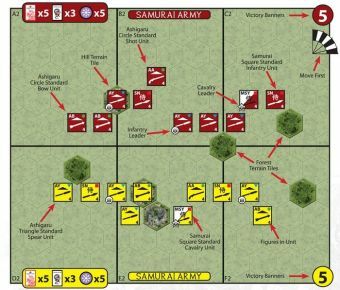 An archer unit (Samurai, Sohei or Ashigaru) occupying an Arrow Tower may fire with its normal combat dice at 4 hex range. Marsh hexes are passable and do not block line of sight. A unit or leader entering a marsh hex must stop and may not move again that turn (including taking ground). A unit or lone leader leaving a Marsh hex may move only 1 hex and stop regardless of its normal movement allowance, and may not move again that turn (including taking ground). A unit which started its turn on a Marsh hex may take ground out of it on a successful close combat but may not take ground again that turn. 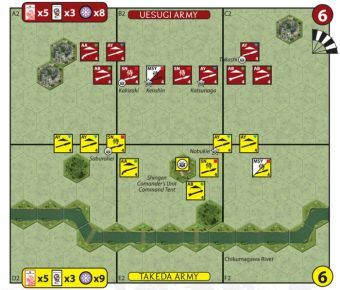 A unit entering a Marsh hex by ordered movement, retreat or taking ground must roll 1 die and loses 1 figure for a matching standard symbol (sword, flag and H&F results have no effect). A lone leader entering a Marsh hex must roll 1 die and is eliminated on a sword result (standard symbols, flags and H&F results have no effect). Units close combat into and out of Marsh hexes with a maximum of 2 dice. A unit on a marsh hex performs ranged combat at a maximum of 1 die. Ranged combat targeting a unit on a marsh hex is unaffected. In all cases, Leader Inspiration and Command or Dragon card effects may increase these die roll allowances. Marsh hexes are considered water terrain (for the purpose of playing the Blue Dragon Dragon Card). Players owning C&C:Ancients or C&C:Napoleonics may use Marsh terrain tiles from those games.